I have been using Cascade Rental for a number of years and have been very satisfied with all members of the company. They are helpful, courteous and will work with me. This is the second year that the four of us friends stayed here at this house. The house was very comfortable and inviting and had everything that we needed. Bluefin Bay 14 was a wonderful retreat! Listening to the wave crash and watching the water from the bay window was spectacular. I was emailing back & fourth with Tami Enggren & she was very professional & handle my concerns right away and laid out different options we could do. That was refreshing and nice to deal with. The location of the cabin was absolutely gorgeous & perfect 5 minute drive to go into town for anything. The view was breathtaking & listening to the sound of the waves all weekend was so peaceful. The only complaint I have is the massive amount of cob webs, every where, it was as though no one had cleaned that cabin in over a week. All the dishes, fridge, bathroom etc were clean, but every corner you looked there were an abundance of cob webs, so my suggestion would be the deep clean the day before a tenant arrives because it most definitely had not been cleaned before we arrived. Other than email we had no interaction - but what we had was nice. We love Grand Marais every time we come up to visit and I can't think of any better place to stay then Cobblestone Cove when we're here. We've stayed in just about every other place in town and this is by far the best. If you have kids the other places with a pool may be better, but for just the two of us this place is the best. Cascade was great. Did everything they said they were going to do in a timely fashion. The Northern Lights cottage was extremely well equipped and spotlessly clean.. 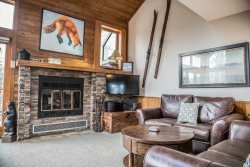 The location is conveniently close to Grand Marais business district. It is pet friendly!! Being next to the highway there was some noticeable traffic noise, especially from trucks going up the hill. I don't know the name of the lady in the office, but we arrived at 5:45 knowing that it closed it 5 PM. She was still there and more than happy to assist us and answer our questions even though she should have gone home 45 minutes earlier. Kudos to such friendliness and customer service. The house was beautiful and very comfortable. Our German Shepherd just LOVED it and was very much at home. All good. Very helpful and understanding. The location was perfectly suited to accommodate our planned activities. I would only add that the view to the lake could be improved dramatically with the removal of a couple of trees. I do not see the point on paying a premium to be on the lake and not be able to see it. The process to rent was very easy. I thought it was a very nice touch that on the day we were to arrive we received a call letting us know about a detour. We reall enjoyed our time. The house was very nice. The Murphy bed was very uncomfortable. It also would be nice if the trees were trimmed a little so you can see the lake a little better from the house. But these things did not have a negative impact on our time. We would definitely use Cascade Vacations again. It is a great location for the things we like to do on the North Shore. All Cascade Vacation Rentals personnel were pleasant and easy to work with. The property comfortable and well-equipped, but the location was its greatest feature. We walked to dinner in Grand Marais every night and wandered on the trails of Artists' Point when venturing out in the other direction. Everything was just great. Will be back. Your people are always great. The house, the location, and the view are all just perfect. This was our second stay. We will be back. All good!!. They sent Pictures of the Dock for me to set up a Rod Holder and check to make sure the WiFi worked upon arrival and got us an early Check In. Top Shelf Service!! Very nice Cabin, although the Hallway and the Main Bathroom are a bit of Cave along with the Kitchen even in the middle of the day, it all worked out great with turning on Lights - we just like natural light as long as we can get it during the day. The Septic Alarm went off a lot at the first part of our stay but when you have the heavy rain the area has seen for the Season not much you can do about that. Living Room Furniture is a bit low to the floor but comfortable. Gorgeous view and perfect location for our needs. The charming personal and vintage decorations were the icing on the cake.